Out of town, but well worth the trip to experience the eclectic menus. 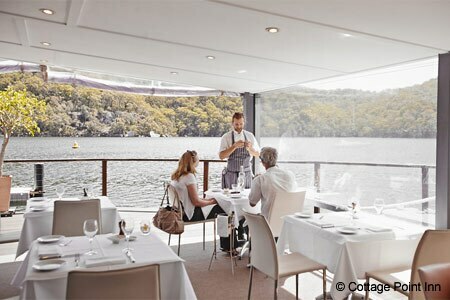 : While Sydney has many lovely waterfront restaurants, the opportunity to visit one away from traffic and crowds is very seductive. Better still, you may elect to arrive by seaplane or boat. This old-style timber cottage has a view across the waters revealing water birds and yachts and small boats. At the stoves as of autumn 2017 is executive chef Kevin Solomon. All meals present an à la carte or seven-course dégustation menu (allow a minimum three hours), with vegetarian options for both. Offerings are eclectic with starters such as torched prawn and smoked cucumber with fennel and basil followed by Wagyu beef, onion and pine mushroom. Then, perhaps if in season, you’ll encounter caramelized pineapple and parfait of coconut to finish. Restaurateur is Shane Olesen and the sommelier is Jim Sanders; the latter’s wine list has a good selection of big-name labels, but also plenty of half bottles and wines by the glass. And if you like this place so much that you don’t wish to leave, maybe you don’t have to, at least not yet. Cottage Point Inn has two apartments available for overnight or holiday stays.